We're so confident that our tyres have been crafted to high standards, that we are happy to cover them with a Lifetime Guarantee*, providing you with piece of mind of your selection. Please be sure to check with your local Dealer that they take part in the Lifetime Guarantee offer*. In the unlikely event of a Prestivo tyre developing a manufacturing-related fault during normal motoring, your dealer will repair it or fit a new Prestivo tyre. This cover continues as long as the tyre has at least 2mm of tread depth remaining across the central 3/4 band of the tyre. The design and engineering of a Prestivo tyre is robust and lightweight and will provide excellent grip and stability at all speeds. Prestivo tyres have been developed and manufactured to high standards. They are built to last and they won’t let you down. 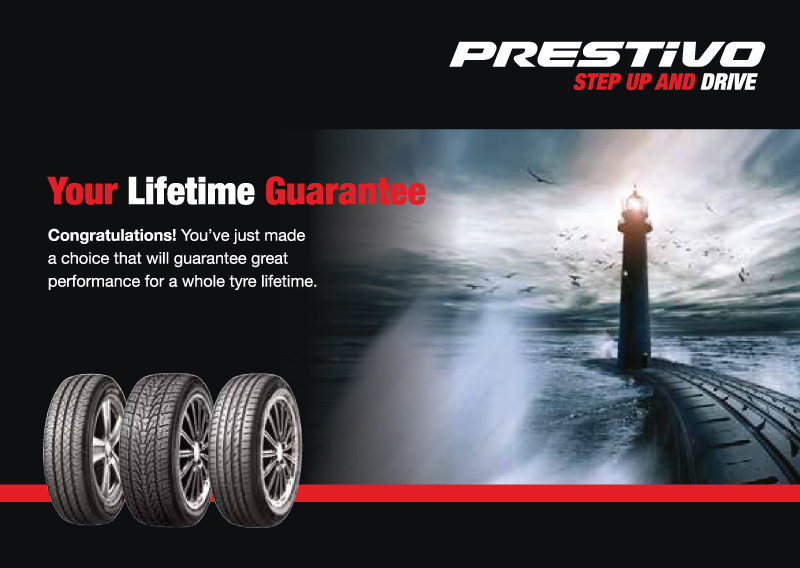 You can be sure that your investment in Prestivo has bought you a full tyre lifetime of service – backed by this lifetime guarantee.